An in-depth look at several tools you can use for hardware detection. Need to raise your Linux IQ? 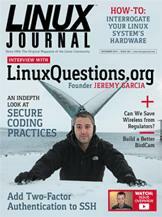 Visit LQ (LinuxQuestions.org). Doc Searls' EOF Can We Save Wireless from Regulators?